Into medium-large bowl, mix all ingredients except syrup until smooth. Batter will be thick. Spray griddle with cooking spray; heat over medium-high heat. For each pancake, pour about 1/4 cup batter onto hot griddle. Cook until bubbles form around edges. Turn pancakes; cook about 3 minutes or until golden brown on bottom. 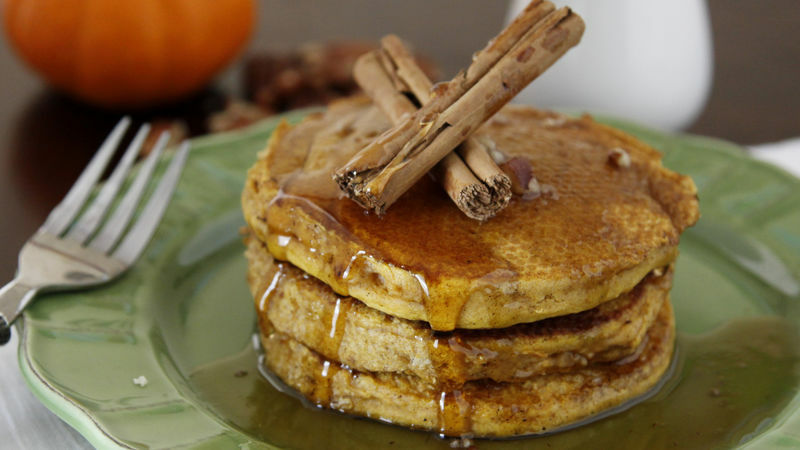 These pancakes are also wonderful topped with crushed pecans. While cooking pancakes, stack and keep in a warm oven until you have desired amount of pancakes cooked.